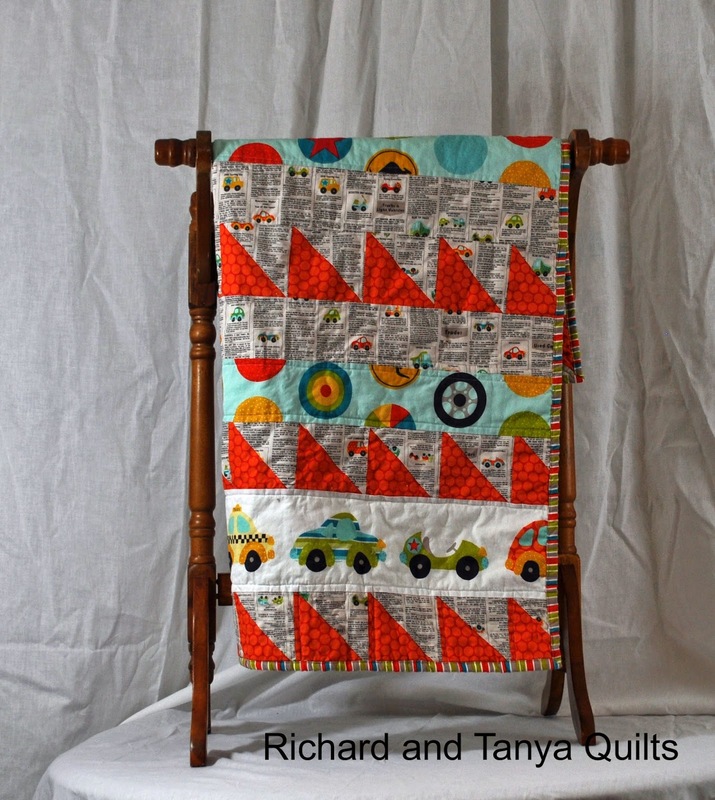 Tanya and I made this car quilt for a family at church who recently had a baby. This is the 3rd quilt we have made with this material it is a interesting print from I believe Australia or at least made for there as some of the signs show kangaroo crossings. 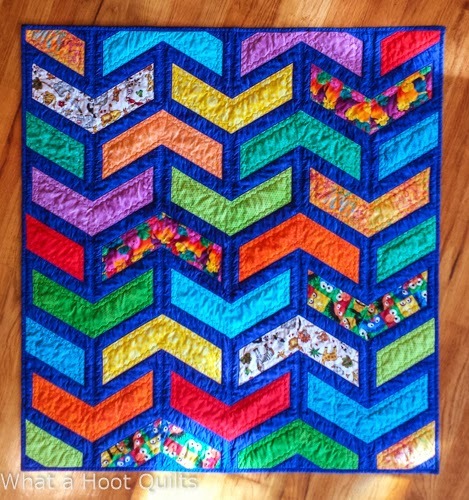 Each quilt we made used basically the same designs. I like but don't like the material at the same time. It is cute but because of the size of the prints its hard to figure out what to make of the material but all in all I think it turned out well. 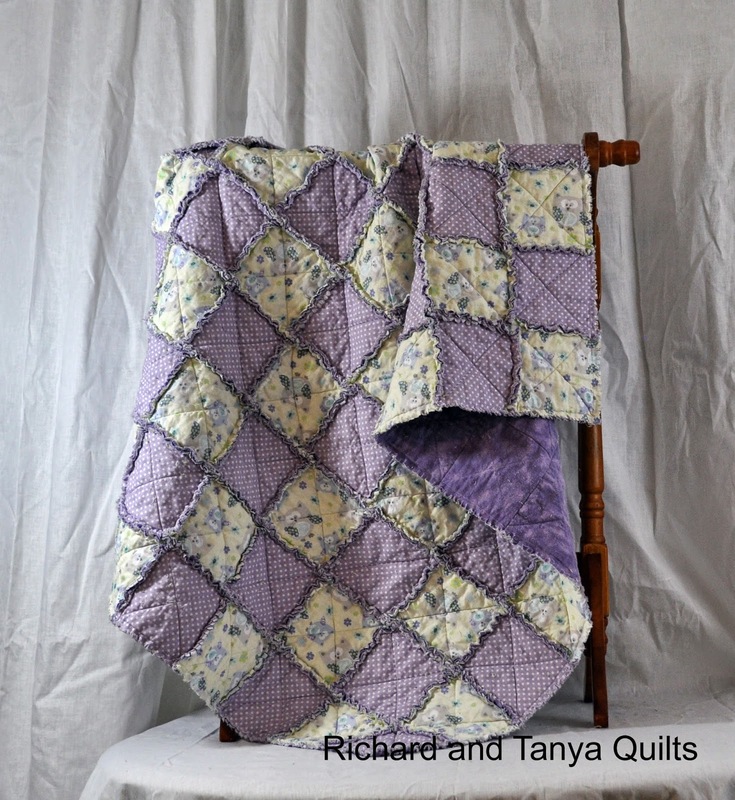 Tanya has been up to her old tricks again making cute rag quilts here is a cute purple owl quilt. 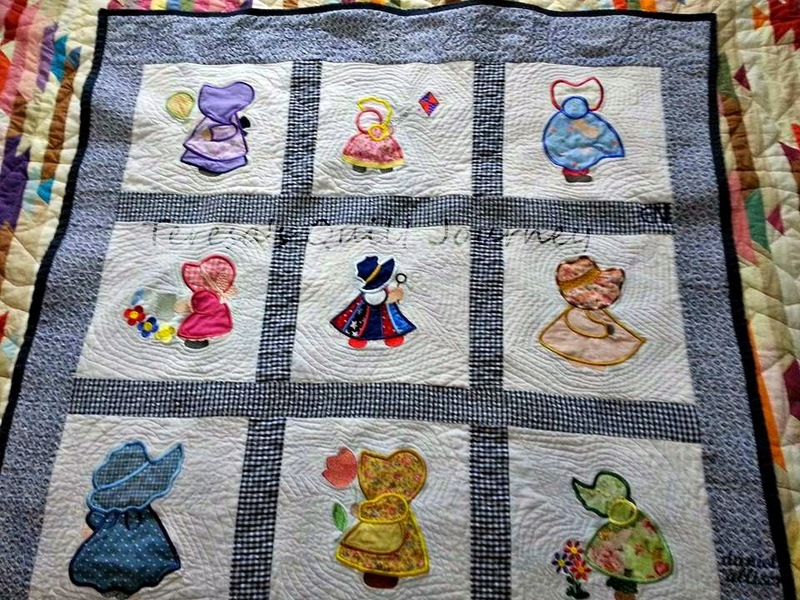 She also took the time recently to sit down and take pictures of many of our quilts that we have not yet posted and those that did not have great pictures I think she did a fantastic job. 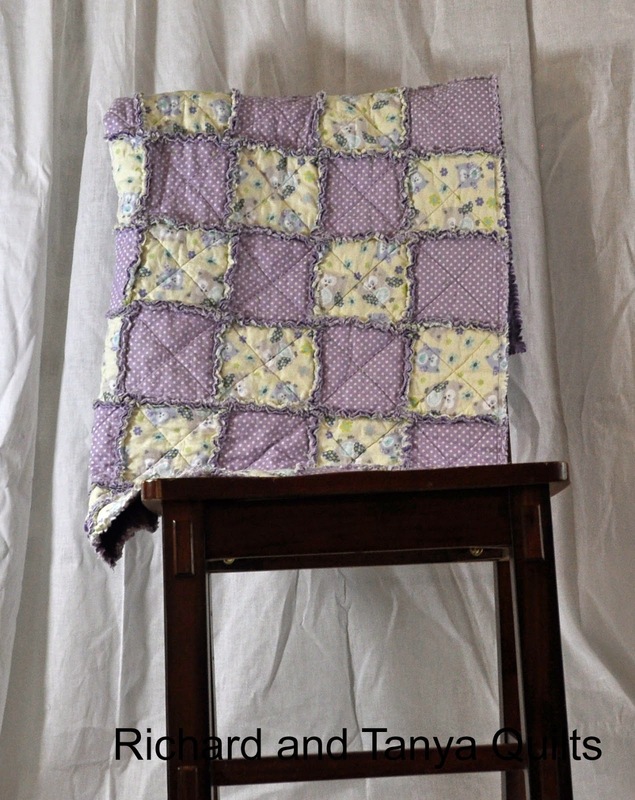 For this quilt she had 2 alternating squares on the front with the purple flannel on the back. 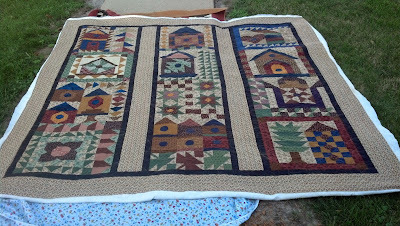 Wow what a month we have had at our house I have finally gotten off my tail end and quilted something. And so has Tanya she has like 6 rag quilts either done or almost so. But I wanted to show off what I made. And over the next few weeks as pictures and blog posts get done we will show the others. Its not complete but its at least a top completed. 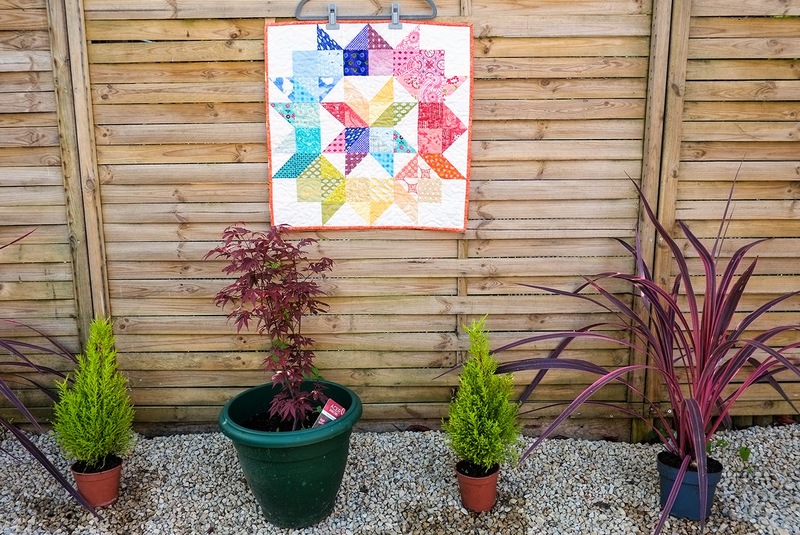 Now to show off the true hero's from last week here are some of the fantastic quilts linked up last week. Here are some great linked up items from the previous week. 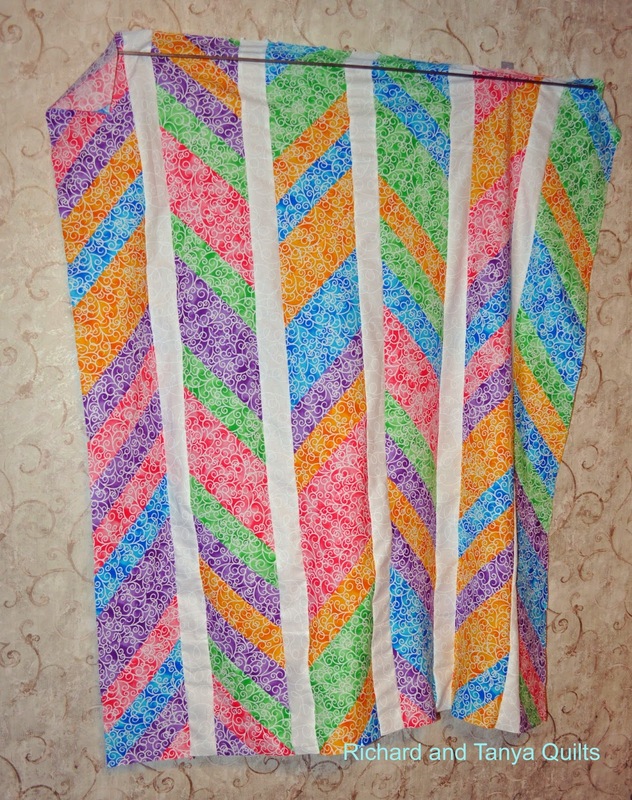 Working on Rag Quilts and other projects! Trying to get back into things after the busy last 3 weeks, Tanya and I decided to do some of the many rag quilts we have been putting off. For my part, I chopped up all of the fabrics and stacked them in piles and spare boxes we had in the front room. 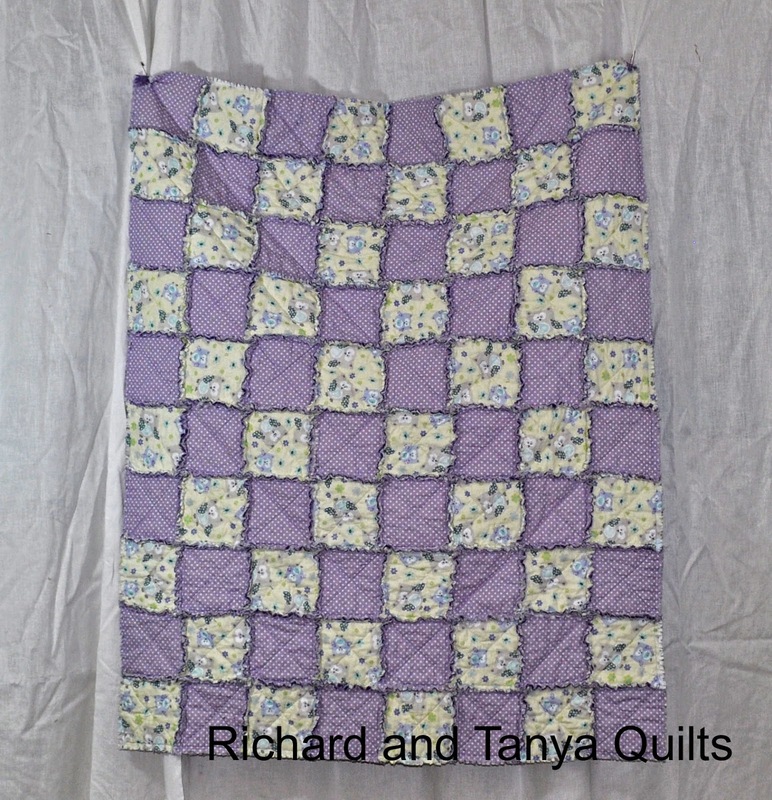 As you can see from the various pictures we have stuff for at least 6-8 rag quilts. The 2 below boxes were given to me from Tanya to sew into quilts. 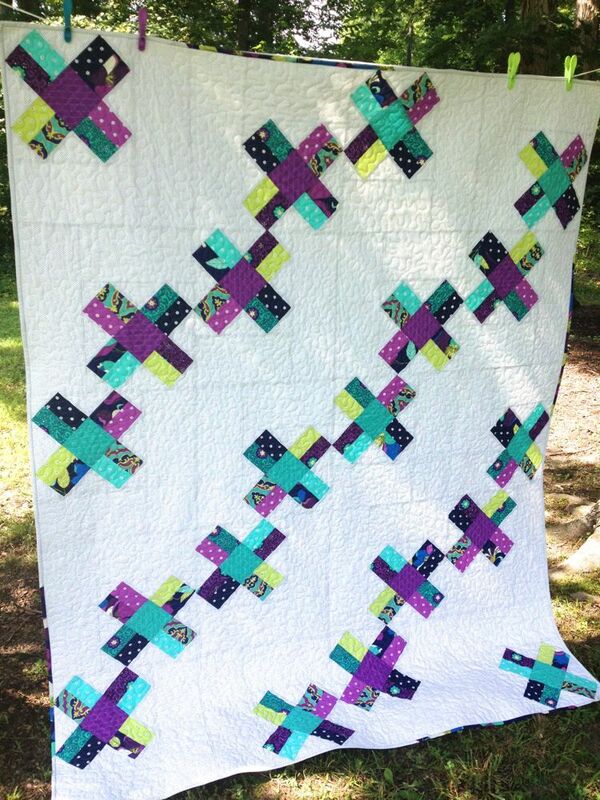 I cut the fabric, she sewed the X's, I sewed the quilts together and she will cut them. Each of us doing the parts that we were fast at. 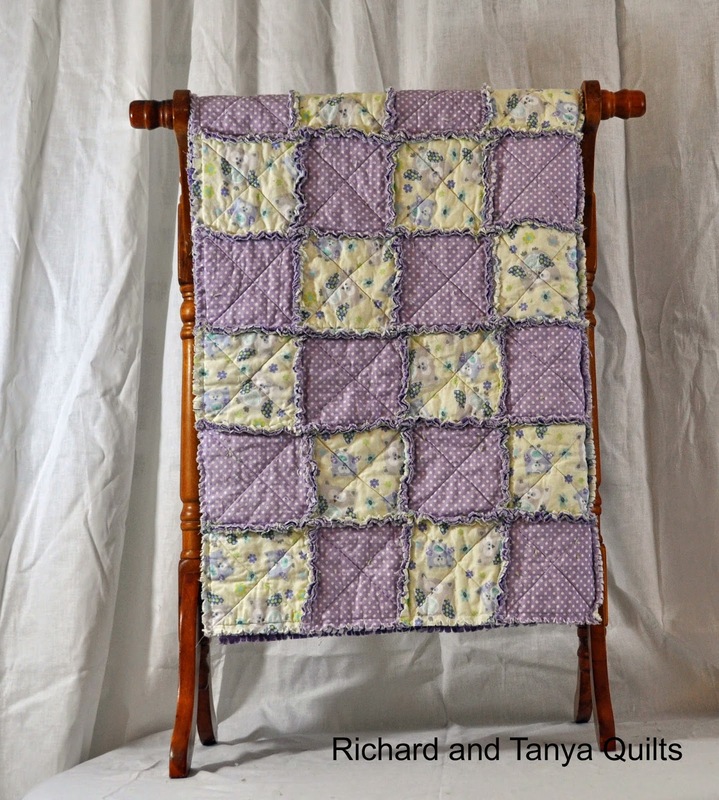 Below is one of the 4 quilts that I finished sewing the 2 above and the green turtles too. All in all its a wide variety of materials and colors. Tanya does a great job picking colors and putting them together. 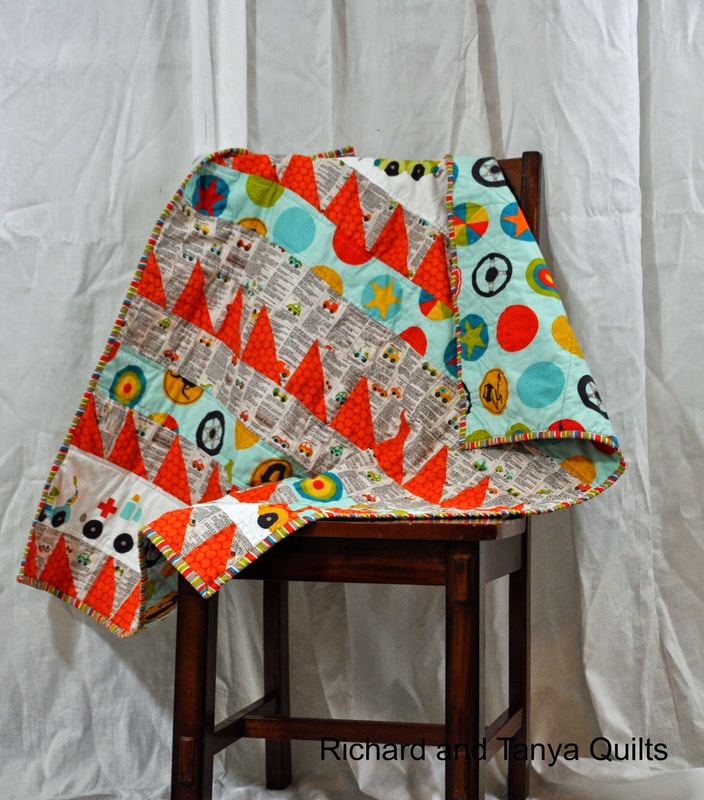 Lastly tonight I started quilting my orange diagonal quilt. When I sat down to make this post, I found this picture in my email. 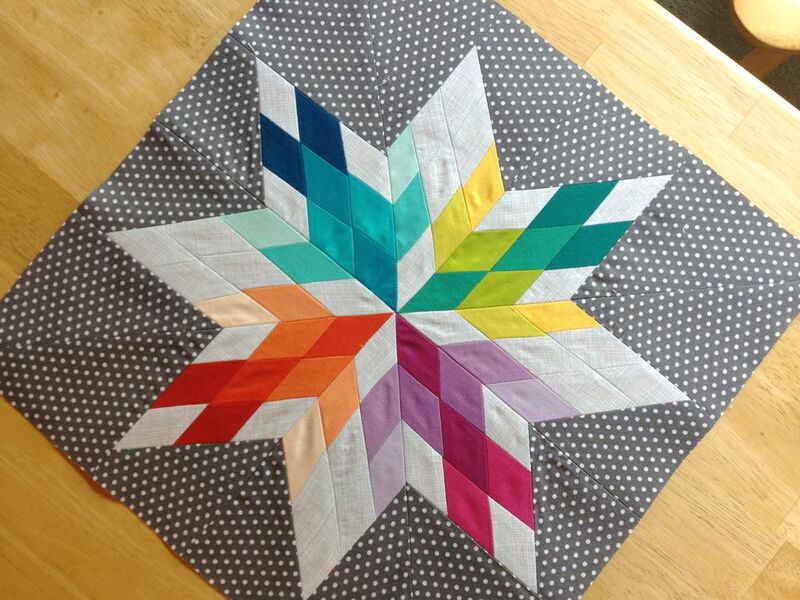 This was created by one of my blog followers that got a free diagonal quilt pattern from me. 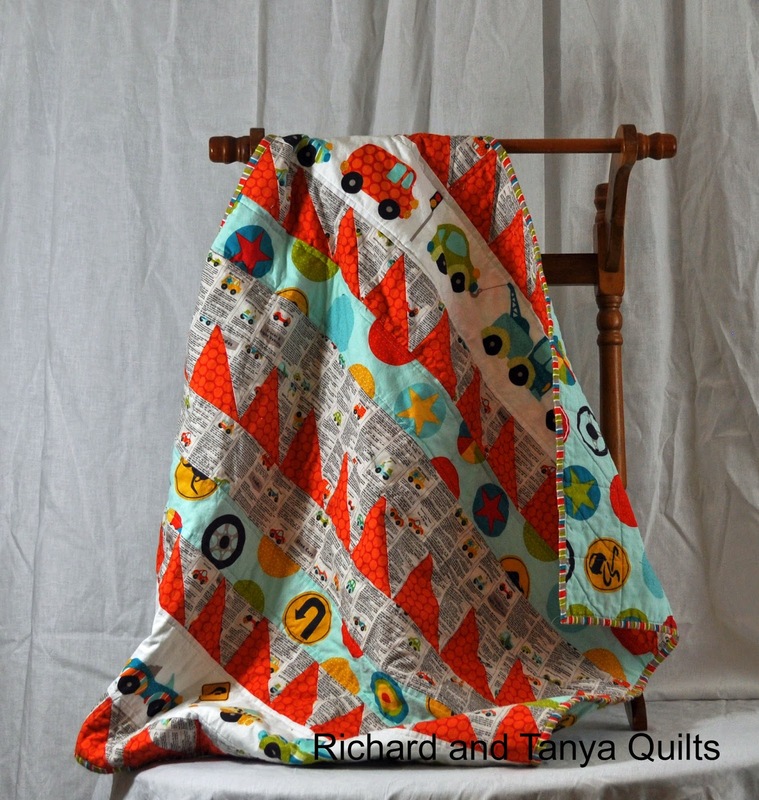 I love how this quilt turned out and am a fan of the red/black/grays together. Two weeks ago before my father in law passed away Tanya and I went shopping and I found some more lizards. My wife gets kind of tired of my impulses but she let this one go. These are some flannel ones we found and I think they are cute. 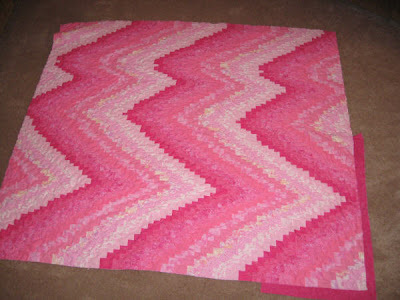 We will make a couple baby rag quilts out of it. Sadly cutting it up was the last sewing and cutting work I had a chance to do. My father in law's funeral was great. Tanya shared some great stories of her dad as well as her sister and a couple friends of her dads. My father in law had a fantastic casket that was hand made with neat designs burned into the knotty pine. The below plaque is a example of the neat work. My father in law was a man of the earth and even his casket spay included dead sage brush, pine boughs and just a few flowers, very fitting for him. His last ride the the cemetery was behind his Jeep, rather then in the hearse that drove in front of it. After the funeral on the 3rd, the kids needed a release and they got to celebrate the 4th with almost every cousin in the family on hand. My son Jared got the ultimate bribe this last week to be good at both the funeral and on the ride up and back home. He earned Benny's Space other wise known as "spaceship, spaceship, SPACESHIP!!" for all of those lost on this, its from the Lego's Movie. I underestimated its cost when I offered it too him as a bribe when I got back it turns out its a $100 Lego set. Good thing he was a great kid this weekend. It even took him 2 full days to assemble it which gave me some more time to rest.